“A TOKEN sprinkling of women,” is how Luciana Berger, a member of parliament for the opposition Labour Party, dismissed the recent British cabinet reshuffle, the avowed aim of which was to make the government less male. Similar cries of tokenism followed last year’s appointment of Julie Bishop as Australia’s foreign minister, which made her the sole woman in the country’s cabinet. 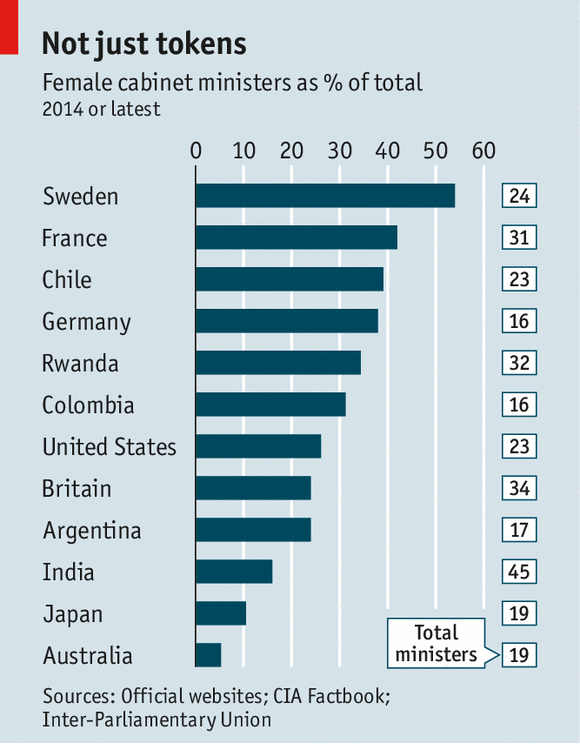 Almost everywhere women are in a minority in government cabinets (see chart for a selection of countries). Some fret that they are treated as mere window-dressing, making the government look more representative but given neither meaningful portfolios nor the support needed to be effective. New research suggests such criticisms may miss the mark. In a forthcoming paper, Maria Escobar-Lemmon and Michelle Taylor-Robinson of Texas A&M University compare the experience and accomplishments of the men and women among 447 cabinet ministers in recent administrations in five countries in the Americas: Argentina, Chile, Colombia, Costa Rica and the United States. Experience was measured by relevant academic background, previous cabinet posts and political connections; and success by the number of bills presented, length of tenure and whether a minister’s time in office ended with firing or forced resignation.